After graduating at the University of Bonn in 2010, Alena Ebinghaus took up a PhD project at the University of Aberdeen, examining inter-lava sedimentation and plant ecosystem development in the Columbia River Flood Basalt Province, Washington State. 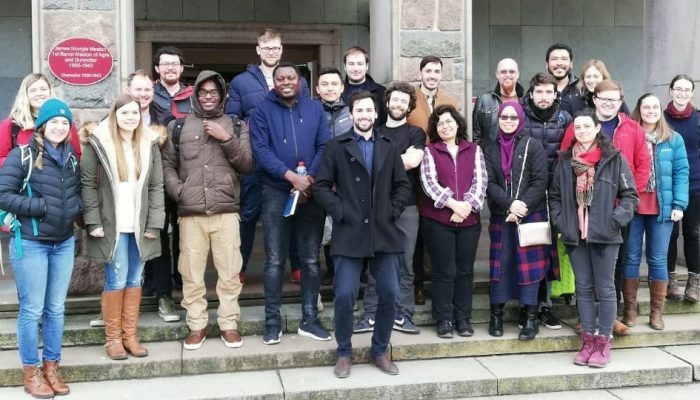 Following her graduation in 2014, Alena joined the University of Aberdeen as a post-doctoral researcher. In her current research, Alena focuses on the understanding of continental environments during past rapid climate warming, such as the Early Danian Dan-C2 event and the Palaeocene-Eocene Thermal Maximum. Since 2017, Alena has served as the Early Career Scientist (ECS) representative of the SSP division. Photographs taken and text written by Daniel Tek (ee11dt@leeds.ac.uk), University of Leeds. Deltaic clastic-rich deposits of the Namurian B, which are found to be rich in large Carboniferous flying insects, such as Homoioptera vorhallensis (maximum length of 70 cm) (location: Hagen, Germany). 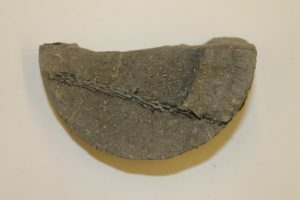 During the upper Carboniferous period (Namurian, Westfalian and Stephanian) large areas of central western Germany were covered by coastal swamp forests dominated by Lepidodendron und Sigillaria. Periodic marine and fluvial transgressions caused the swamps being regularly buried by siliciclastic material, resulting in up to 5500 m thick successions of alternating organic-rich and clastic-rich sedimentary rock. The organic-rich packages were later subject to coalification producing up to 100 individual coal beds in the area of the river Ruhr. Presumably, initial (private) coal mining started during the Middle Ages, however, with the onset of the Industrial Revolution, commercial mining started and peaked in the 19th until mid of 20th century with more than 120 million tons of coal mined per year. Today, only a few pits are mined sporadically, with the last pit (Zeche Proper Haniel) ceasing service this year. 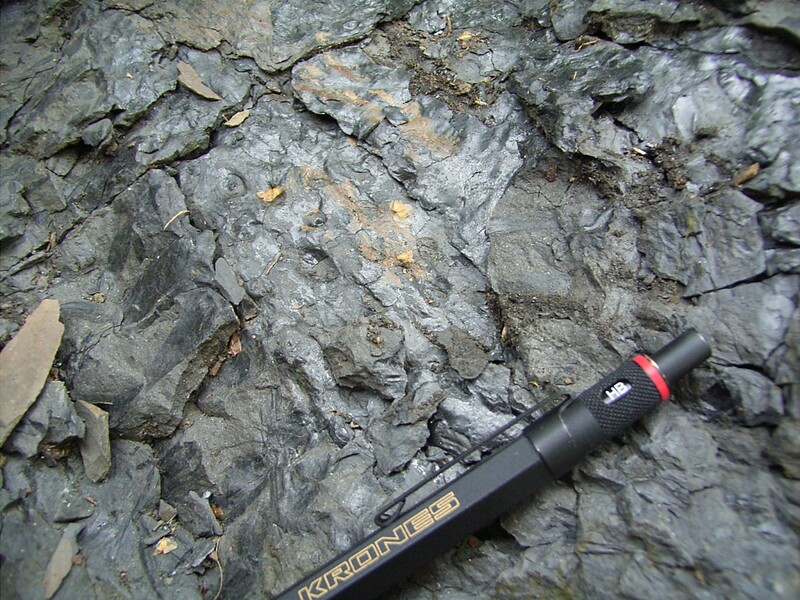 Upper Carboniferous plant fossils (probably Coniferous) found in coal seams, (Esperschörpen Siepen, Germany). In my last blog, I described the diverse world of pollen and how palynology – the study pollen, is used in geosciences. Today, I turn to another microcosmos: that of finest layers deposited at the bottom of a lake. A large majority of geoscientists would tell you the best part of their job is field work. Despite sometimes harsh weather conditions, long hikes in wind, rain or merciless sun, many geologists enjoy the outdoors and look forward to a great rock exposure. While I very much enjoy field work myself, some of my current research brings me to the core lab at best. 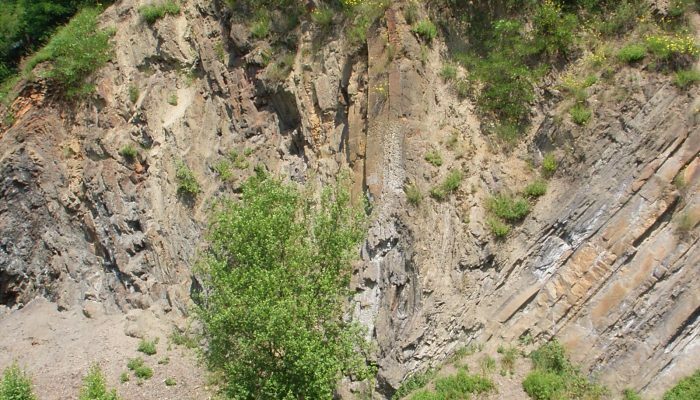 Here, at the University of Aberdeen, we have access to a 400 m long core of rock, which was drilled 10 years ago with the help of the Open University and University of Kiev in the Ukraine – a core drilled in the centre of the so-called Boltysh meteorite impact crater. 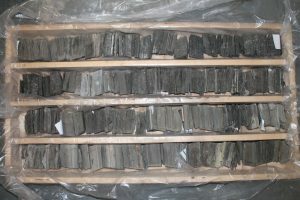 Part of the core recovered by drilling ancient lake sediments in the Boltysh meteorite impact crater, Ukraine. The Boltysh crater formed about 65 My ago, which brings it in the same age range as the more prominent Chicxulub impact, which by some scientists is considered as the cause for the extinction of dinosaurs. The Boltysh crater, however, probably formed a few thousand years prior to the Chicxulub impact, and is of much smaller size. What makes this crater so interesting for us is that shortly after its formation, a lake began to form at the crater bottom, slowly filling up the entire crater with finely layered lake sediments over a period of nearly 1 million years. Importantly, these sediments cover the first 500.000 years of the earliest Palaeogene age (=Danian), which is known for its unstable climatic conditions. Understanding how climate and environment changed in the past is a crucial step in better understanding modern climate change and its short- and long-term impact on Earth. 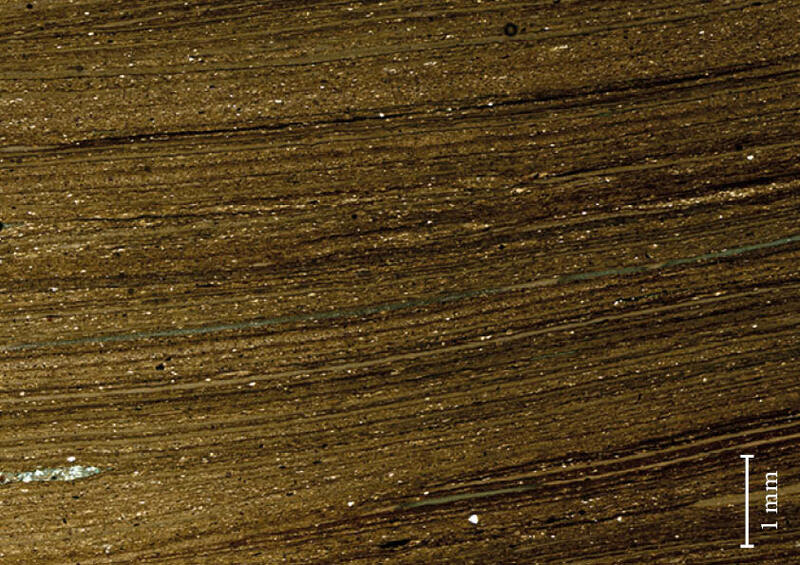 Modern lakes typically produce very fine layers of debris at the bottom, often less than 1 mm thick. These layers, sometimes referred to as varves, may vary from year to year, and even from season to season, similar to concentric tree rings. Ancient lakes and their deposits show very similar lamination of sediment. That way, both modern and ancient lake sediments may give detailed insights into how environment and climate changed over a few years or decades – and this even from many million years ago! 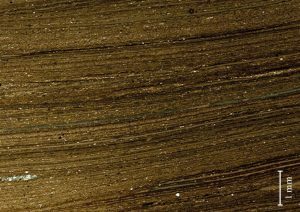 Slide scanner image of very fine lamination formed during deposition of sediments at lake bottom, due to seasonal changes in sediment supply and composition (Boltysh meteorite impact crater). The core recovered from the Boltysh meteorite impact crater reveals lamination as fine as 0.08 mm. Individual layers – or laminae, therefore need to be examined with a high-resolution microscope or core scanner to distinguish slight changes in mineral, chemical and grain size composition, as well as fossil flora and fauna content. These information are used to reconstruct how environment and ultimately climate changed through geologically short periods of time. 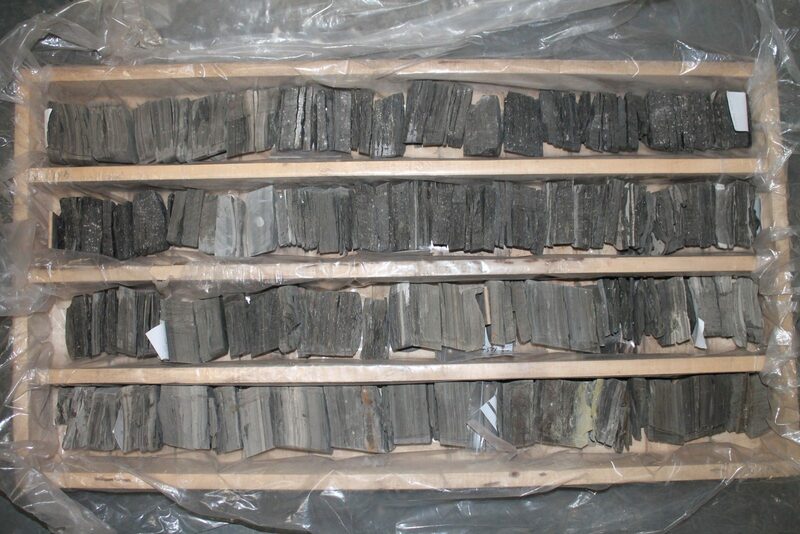 Although 65 million years old, this core contains valuable information on how Earth responded to climate change in the past – which helps to better predict changes of our environment in modern and future times. Plant fossil (here part of a conifer), Boltysh meteorite impact crater. Core width c. 8 cm. You wouldn’t go in the early basement during the upper afternoon, don’t you? I remember it perfectly. It was 13 years ago, while writing my first manuscript, I was first confronted with that thing that challenges a lot of junior stratigraphers, especially when they are not a native English: Geochronology vs. Chronostratigraphy! Or to simplify, how to properly distinguish time and time-rock units in your writings. Several papers have been published on this subject, out of which I would recommend the recent Zalasiewicz et al. (2013). But, although these papers do provide a very clear scientific explanation on this subject, I always remember myself 13 years ago and how difficult it was for me back in those days to understand these concepts! So, is it that difficult? Or is there an easy way to spot the light at the end of the tunnel? Well, if you have spotted the oddness in the title of this blog, the good news is that you have already made 3/4 of the way. Of course, the trick is in the use of early/late vs. lower/upper, that is to say on the distinction between time (geochronology) and space (chronostratigraphy), respectively. Let’s have a little test to check that. Which of the following five sentences are wrong? 1. The late Bajocian is 500m-thick in this region. 2. The upper Bajocian can be correlated throughout this region. 3. The lower Bajocian has experienced environmental changes. 4. A carbon cycle perturbation occurred during the early Bajocian. 5. The lower Bajocian carbon isotope excursion. Without having too much suspense: it’s the sentences 1 and 3 that are wrong. In sentence #1, the term “late” is used whereas the sentence makes reference to time-rock unit, i.e. chronostratigraphy. Here, Bajocian refers to the thickness of the sedimentary sequence, so one should use the term “upper”. However, if you insist on using “late”, then you should write the sentence as following: “The thickness of the sedimentary succession dated from the late Bajocian is 500m”. In sentence #3, we have the opposite case, i.e. the use of “lower” while referring to time, i.e. geochronology. It is as odd as “having a meeting in the upper afternoon”. There you go, you have done 3/4 of the way. What about the last quarter? The answer is in sentence #5. It is indeed correct, and refers to the carbon isotope excursion you have measured in the Lower Bajocian, i.e. in the section you have worked on. But writing “the early Bajocian carbon isotope excursion” is also correct, but this time it refers to the carbon cycle perturbation that has occurred during the early Bajocian. You know… the one that is recorded in the lower Bajocian! But never say that it is recorded in the early Bajocian, that would be wrong. Zalasiewicz, J., Cita, M.B., Hilgen, F.J., Pratt, B.R., Strasser, A., Thierry, J. and Weissert, H. (2013) Chronostratigraphy and geochronology: A proposed realignment. GSA Today 23, 4–8.